My favorite cookies I made this year! So, 2012 was a good year. Really, I have few complaints. Let's have a peek back at some blogs, shall we? January was a little recap, but I also posted my Aunt Evelyn's Ham Balls. These are so fantastic. I made them again and again, and even made them on a pizza! February was a big month, and my Pantry Raid cookies were a hit! But February also saw my biggest blog of the year, Sweet Chili Chicken Wings. And why not? They are delicious! I made them as a part of the Secret Recipe Club, which I graciously dropped out of. 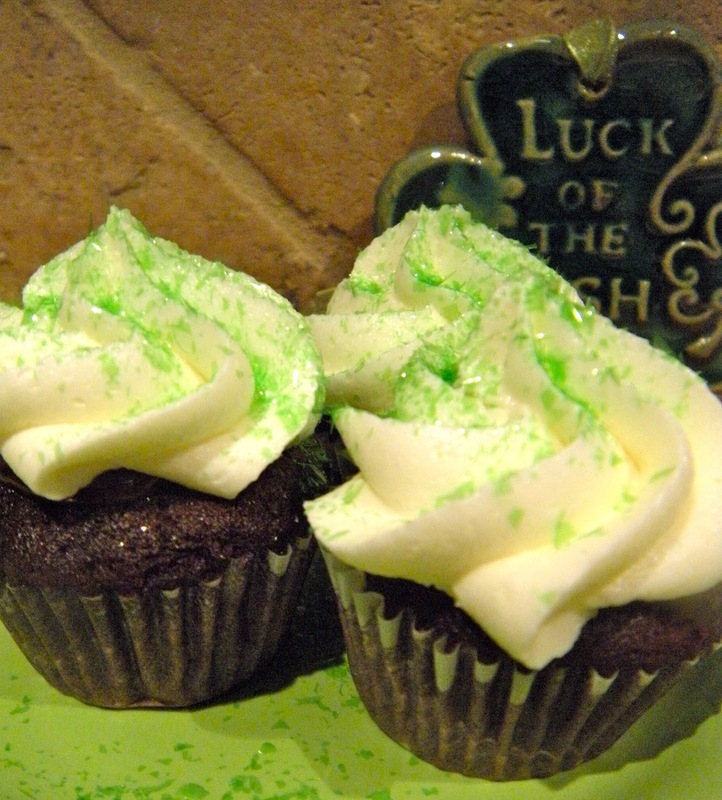 March brought Irish Car Bomb Cupcakes, again from Secret Recipe Club. Yea, they were decadent in many ways. Mainly because they are loaded with alcohol and buttercream. Not much can go wrong there! I really enjoyed making these! In April, I made some of my favorite sugar cookies for a teenage boy's birthday. After a weekend in KY with cookie people from all over the country, I was so inspired! Nothing says congrats like a shotgun! May was a huge month, 12 blogs! Lots of cookies for weddings, graduations, First Communions...I was a busy blogger! I also made an amazing Sweet Potato Salad that we had at a wedding. I'm sort of in the mood for that salad right now! Sweet Potato Salad I duplicated from the Ritz Carlton...yum! June was the start of ice cream season (even tho we had been running the AC for a few months already! ), and I obliged with Cannoli Ice Cream and a Butterfinger Ice Cream Pie. 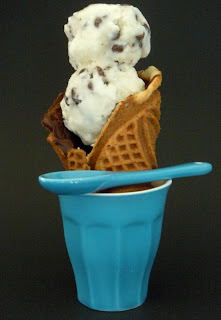 I love cannolis, and it makes delicious ice cream! It was pretty darn good. I also made cookies for Father's Day and cookies that I was pretty excited about for Williams Sonoma. Cookies for the store. I also passed my 15 year mark there! July is my favorite month. A couple of birthdays, the Fourth, things are usually pretty calm, and pretty hot too! I made these amazing Asian Chicken Sandwiches with Rainbow Slaw from one of my foodie blogger friends, Lisa. You can find her at Parsley, Sage, Line Drives and Desserts. She makes beautiful and delicious food. She is also a great writer. August stinks. It makes me sad. My kids pack up and head back to college. And they are so excited about it. I guess I am usually ready too, but it seems like I go from a home to an empty house. Scott and I trip over each other for a few days, and we just want to talk to them to make sure everything is okay. I mean, how do they survive without me? I busied myself with cookies. Creative outlets are the best cure for anything that makes you sad. For a campaign. He didn't win, and I am sorry for that! A first Birthday...Arden loves my cookies! 50 is fabulous...so they say. Political cookies, birthday cookies for a One Year Old and a Fifty Year Old, sorority cookies and playwright cookies. Nothing like bags of royal icing all over the kitchen to make you forget your kids are having a blast at college. The first ever, and it was a blast! September through December was a little slow. I had my kitchen tore up, I saw some college football, saw lots of college volleyball, made 3 trips to Iowa, a trip to Oklahoma and went to Cookie Con in Salt Lake City, Utah. I spent Thanksgiving with my entire family in Florida as we celebrated my parent's 60th wedding anniversary! I blogged some cookies, but little else. I am ready for the New Year, all those resolutions, what is in store for me and my family. I hope the New Year is good to you and yours, and we will see you back here in January! Happy New Year! 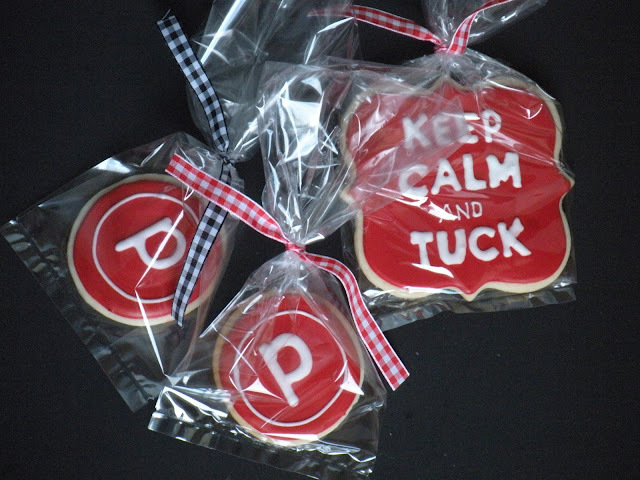 Cookies for Pure Barre. I will be spending lots of time there after the holidays! So a few weeks back I made Santa and Rudy cookies for my friend. I plastered them on FB and other friends were like...whaaat? I want some! I try to limit my cookie baking at Christmas, because I feel like so many people make time to bake special cookies at home. Well, apparently not this year. I am baking non stop for my friends, and quite happily. 90% of my cookies are Santa and Rudy, and a few snowmen, holly, and other things thrown in for good measure. I thought I'd give you a quick peek between mixing colors! What are you waiting for? Get in there and bake! I love Phyllo dough. There are a million things you can do with it, and those flaky layers just shattering with every bite! Growing up, we made our own. I know, crazy, right? We call it Pita in my family, think of that Greek pastry called spanikopita. Do not think of pita bread. Our pita is phyllo. My Serbian background has a lot of Greek influence. But interestingly enough, we never had it layered and sweet like Baklava. Years ago, we had a Daring Baker challenge where we made it, and it was a fun project. Not the most successful, but still tasty. I would love to make it with my mom one day...hint, hint, hint! For supper club, I chose to make this apple version. So delicious, right out of Bon Appetit. Apple Croustades with Bourbon Brown Sugar Ice Cream. I can't lie. These were crazy simple to make, and amazingly delicious! I do buy my phyllo from a specialty grocer, and it is a little pricier than what they sell at Kroger. It is worth it. The sheets are bigger, and the turn over is much better, so unlikely that I would get a crumbly box of old phyllo. Also, after I made the croustades for supper club, I made a little more filling and made a more traditional Serbian Pita. We roll them into logs. I baked them until golden, and put them in the freezer. I know a couple of college kids who will be most happy about this! It seems silly for me to totally reprint the recipe, as I followed it exactly. I know, shocker. But I didn't use a muffin tin for my croustades, I chose to build them in ramekins. This way if they didn't slide out perfectly, I still had a serving vessel attached. They did release beautifully. Perfect. Delicious! Where's the plating photo? I think on my phone. Let me look, and I will update. If I didn't take any, which does happen after a glass of two or wine, then you'll have to make your own! What are you waiting for? Get in there and bake! Upside Down Gingerbread man, sans the feet! You know the song. A friend called and wanted cookies for a preschool party. Santa faces and Rudolphs. Yep, that was it. Pretty straight forward, fairly basic, except...I don't have either of those cutters! So what to do? Last month at CookieCon, Sugarbelle did a lecture on redesigning your cookie, thinking outside the cookie cutter if you will. Well I listened, and thought I had a good grasp on it, I mean this is the 2nd time I've heard her give this talk. So what did I do? I came home and threw away all my undecorated, frozen Halloween cookies. Then I confessed it on the Cookie Con Facebook page, and the lashing commenced. I just couldn't see anything but ghosts and spider webs. There are some amazing, talented bakers out there, and they did amazing things with their Halloween cookies. I, did not. I decided I could work out Rudy with my Frankenstien head cutter and prepared to bake, when I got a Facebook message from the greatest volleyball coach of all time in Bahrain. She posted a platter of reindeer made out of an upside down gingerbread man. So, yea. Look at me! Here's hoping those 1 year olds love their cookies! And stay tuned, there is much more to come! What are you waiting for? Get out ALL those cookie cutters, and bake!